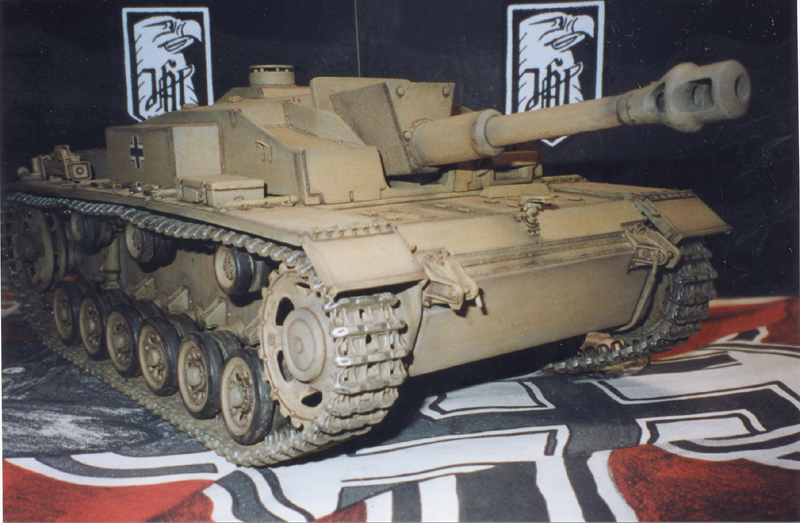 STURMHAUBITZE 42 10.5cm (StuH 42) IN 1/15 SCALE. The Sturmhaubitze(StuH 42) was a special version of the StuG III armed with a powerful and potent assault howitzer weapon whose ammunition could achieve a much greater explosive and fragmentation effect for maximum crippling effect against enemy personnel. Uncanny in it�s gift, deadly in it�s application, it lifted the StuH 42 to the level of the unforgettable. It proved itself in action in the battle of the Cherkassy breakout when trapped German units armed with this weapon in one of the most outstanding triumphs of determination over adversity in the annals of the war punched a hole and blasted it�s way out through the overpowering soviet forces, Of 56 000 men trapped in the pocket, 35 000 managed to escape and their performance amazed the world, it was unheard of at the time and the world was staggered (and stunned the soviets) Thirty five thousand of the finest young men in Europe! Thirty five thousand builders of Europe! Without hesitation they sacrificed themselves for their beliefs, they knew they had to give an example, they were the first on the front lines as a way to defend their country and their ideals, in victory or defeat these men always sought to be the best representatives of their country, they were the first to go and fight in an extraordinary spurt of comradeship, this comradeship was one of their most distinctive characteristics, from superior to inferior, each one was the comrade of the others, not since the great religious orders of the middle ages, had their been such selfless idealism and heroism, in this century of materialism, these feats stand out as a shinning light of spirituality, a true fighting force of man and machine, led by a strong hand, which possessed then the only real effective unity that which is derived from devout faith, as brothers in combat and brothers in ideology, this was supported emphatically by the reality of their arms, their troops, their ideals, and their iron-will, giving them the sure ability to endure any difficulties. On the battlefields of Europe they defended a great past and the construction of the future, the construction of a true Europe of high ideals and beliefs held as a common bond, they felt that Europe has a unique destiny and must unite, only the teamwork of free men bonded by a high ideal could unite Europe, a foundation for real European unity. These men saw the new Europe in the form of three great components; central Europe as the powerhouse of Europe, western Europe as the cultural heart of Europe, and eastern Europe as the potential of Europe. Thus the Europe these men envisioned was alive and real, it was in this span that Europe could achieve it�s destiny, this Europe would be the beacon of the world. They prepared for the high destiny of Europe. A united Europe that later on became a reality (NATO), and they had proven their actions in the whole period of the great struggles of the eastern front that some of that credit belongs to them! A solemnly paid tribute to the heroism for those who had a solemn duty to gather all their efforts and strengths to fight and free themselves from Stalin�s declared intention to exploit the spread and shroud of Bolshevik society over Europe on the bayonets of the Red Army.